If you are considering buying your own photovoltaic solar panels rather then opting for a free system so that you can claim the yearly tax free solar panel grants yourself then we have reviewed the prices again for 2011. This will give you an idea of the complete cost including VAT, installation and any other costs involved in getting a system installed. We previously took a look at how much solar panels cost and worked out how long the payback period for solar is to show how cost effective solar now is in the UK. Millions of people in the UK have homes that are ideal for solar and could be benefiting from tens of thousands of pounds of tax free grants that mean you will be much better off financially compared to not buying solar. How Much Do Photovoltaic Solar Panels Cost In 2011? I have taken quotes from a number of installers for different sized solar arrays from 2.7kWp up to 4kWp. To be able to claim the highest rate on the feed-in tariff you will need to stay just below the 4kWp figure so you would actually install a system that is 3.96kWp. It seems like a strange mandatory figure but a system that is 3.96kWp will earn you 43.3 pence for every kilowatt of electricity that you produce whereas a 4kWp system will only earn you 37.8 pence per kW. The list below is comprised of 361 quotes for different sized solar systems to show the lowest and highest quote for each different sized system. These figures were collected in June 2011 and give you a guide to the amount you would pay for a complete solar photovoltaic system being installed. If anything, from the range of quotes received it shows just how varied the range of prices is from different installers for the same system. The difference in price can vary by as much as £8,000 for some of the systems quoted. This is true for one of the largest sized arrays at 3.9kWp which is about the largest system you can install and still get the highest feed-in tariff rate under the governments grant scheme. 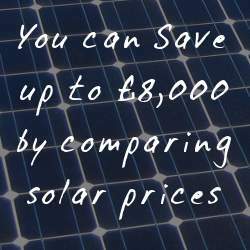 According to the Energy Savings Trust cash back calculator¹ having a 3.9kWp system installed would make you £1,920 a year better off giving a total lifetime (25 years) benefit of £48,001. If you took the lowest quote you would have earned back the cost of the installation within 7 years. Before even considering getting solar installed you need to make sure that your home is suitable. You will need to have a roof that faces south, it doesn't have to be due south as modern systems still work well if they face almost east or west, although due south is obviously preferred. You should have a large enough roof with enough free space so that all the panels can sit together without any gaps. This is the preferred way to install a system but most installers will be able to accommodate any paid system. You can find out more about the effect of roof angle and orientation for solar panels and how it affects panel performance. Solar photovoltaic systems are a big investment so you want to make sure that you are getting the best deal. It could mean the difference between a 7 year payback period and an 11 year payback period and most people would want to benefit from 4 years extra profit (almost £8,000) in some cases. It is important that you get several quotes, the more quotes that you do get the less you will be paying for your system. A quick way to get 3 quotes is to fill out our solar PV quote form. You will be contacted, explain you want quotes for buy solar PV and you will be offered 3 no obligation quotes from installers in your area. It is a much quicker way to get quotes without having to research different installers in your area and having to phone each one individually. This way they will phone you. The installer will come out to do a survey, make sure you are getting an installer doing the survey and not a salesman. To get the best out of your system it will need to be installed to take maximum advantage of the sun all year round but especially in summer where a bulk of the electricity will be produced by the panels. Make sure that you are armed with a notepad and pen and have questions to ask and make sure that you write down the answers. If you don't how are you going to be able to make a comparison between the installers?